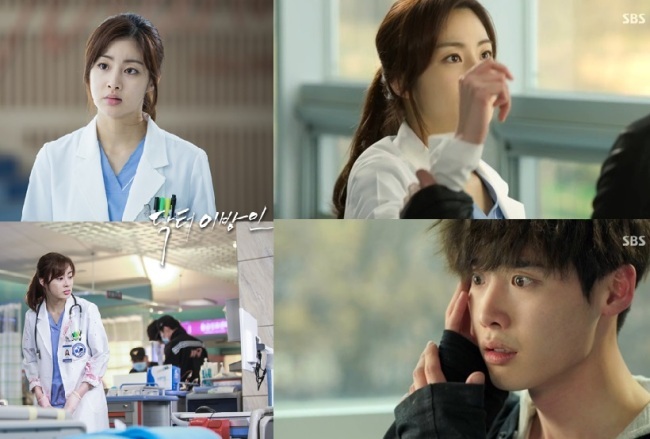 An embarrassed Kang So-ra slaps Lee Jong-suk in the third episode of the SBS medical show “Doctor Stranger,” aired on Monday, marking a fiery first encounter at the hospital. Oh Soo-hyun, played by Kang So-ra, becomes upset when Lee Jong-suk, playing Park Hoon, pops up out of nowhere and successfully operates on an injured man whom she failed to save. Oh is a doctor and illegitimate daughter of a rich hospital owner, whereas Park is an orphaned water delivery man. Oh Soo-hyun storms up to Park Hoon and says, “There is no difference between killing someone and giving a surgery without a medical license.” But Park instantly strikes back: “Look who’s talking -- you ran off on the patient, and we are both quacks,” earning a second slap in the face. “Doctor Stranger” is a romantic medical drama, starring Lee Jong-suk as Park Hoon, who was kidnapped to North Korea with his medical guru father and flees to the South after losing his father and one-and-only girlfriend Song Jae-hee, played by Jin Se-yeon.